Our latest label design is about to hit the shelves—any day now you’ll be able to get “Poop Deck Pale Ale” at a store near you! MUKILTEO, WA – We know what you’re thinking. Go ahead and make all the punny jokes you want. We have. Of course that was after everyone was informed that the Poop Deck is simply a deck above the Captain’s Quarters in the aft of a ship. Don’t judge this beer by its name. 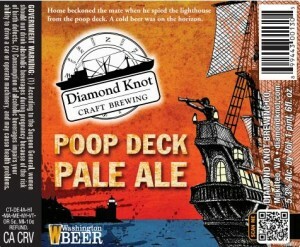 It’s our brand-new Pale Ale release, a first from Diamond Knot! Your basic Pale recipe consisting of 2-row pale malt, Cara-pils® Malt, Crystal malt and just a touch of flaked barley for some body. Galena hops provide the body of the bitterness and super-alpha Apollo hops in the finish and dry-hop add a bright, citrusy hop flavor and aroma that’ll keep you coming back for more. O.G. 12° Plato; 23 IBUs; 5.3% ABV. The first pints of Poop Deck Pale Ale will flow at the Brewery & Alehouse, Tuesday, Oct. 15, at 6:30 p.m., just before glasses are raised in celebration of Diamond Knot’s 19th anniversary. Everyone is invited.